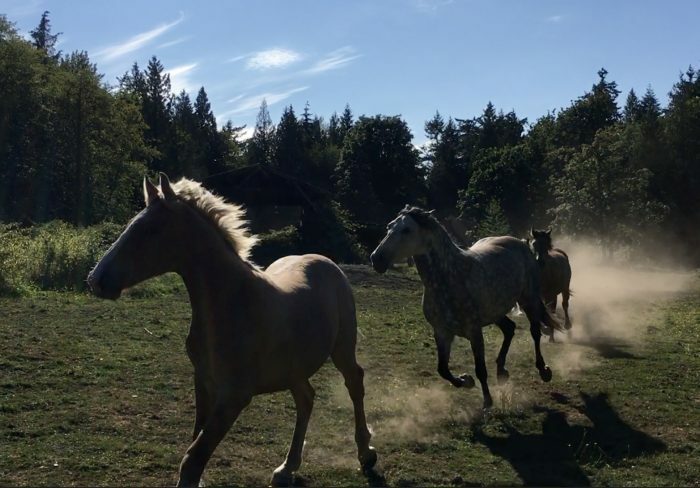 After Kaliah gave me a strong signal, in Part 1 of this story, that she was indeed meant to be with my herd, you would think that this next part of the story would be about her introduction to the herd… But it’s not. Because she’s still up at Cheekye Ranch in Squamish, B.C. It’s funny how our own minds just blank out or delete things we can’t really cope with. Here’s the thing: Based on my trailer experiences with my own wildies, I cannot fathom how or why Kaliah would EVER want to get in a horse trailer, period. So rather than opening a dialogue with Kris about my experiences and my thoughts, reservations etc. and asking to brainstorm ideas, I decide to just remove myself from the procedure entirely. Here’s my faulty logic: I figure that, since both Kris and my very experienced trailer guy, Kevan, have worked with wildies before and since they both feel positive about getting her on the trailer, I should just leave it to them! I figure that if I am there, or if I voice my thoughts, I’ll jinx the whole thing and then there’s no way she’ll get on. By me staying completely out of it, I figure at least we have a chance of her getting on. Yep. No way, hosea. Kaliah and her two herdmates move as one pod, absolutely refusing to allow anyone to cut her out of the herd. At one point, all three get in the trailer together. But as soon as they start trying to cut one of the others away, Kaliah blows out the trailer, scales an arena panel, and that’s the end of that. She also charges right through the solid wood fence – thankfully into the other field and not into the woods. She shows us in no uncertain terms that she is the kind of horse who will never be pressured into anything – she would rather fight to the death, or until she broke a leg. Kris calls me to let me know what happened, and of course, we call it a day. Now understand that all this happened without any tools (whips, sticks, flags etc) being used, Kevan and Kris just used their own bodies. They also spent a good hour and a half letting the horses see the trailer and slowly moving them closer to it – by walking calmly behind them. Letting them eat hay, moving a bit closer, and so on. Well, now that I decide to pull my head out of the sand it was so hopefully buried under, and step the frick up, I finally have the conversation with Kris I should have had in the first place. 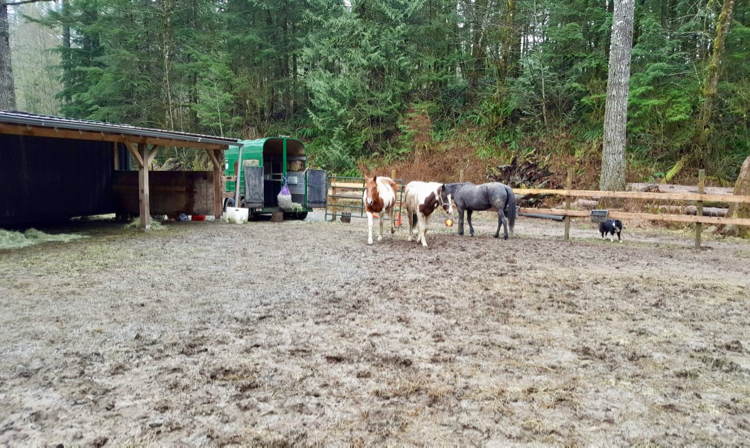 Culled from their herd – A wildie’s first experience with a horse trailer is when they are culled from their herd and driven, in a group, usually with whips and lots of aggression, onto the trailer that will take them to the holding pen, or slaughter house, or auction. So what is their primary imprint of a trailer?? And like every species, this new, terrifying, life-threatening experience will be mapped by the brain for the purpose of future avoidance or escape. 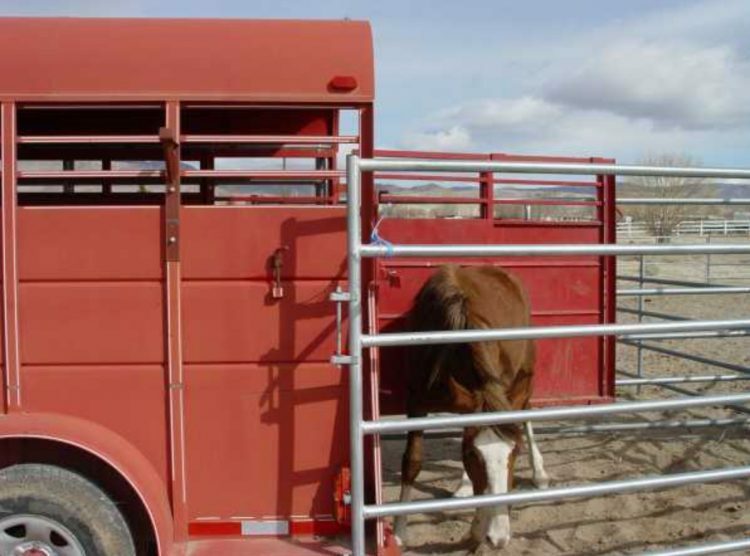 Sent to a holding facility – The next experience a wildie has – if they are rescued from slaughter or sent to a more long-term holding facility – is to be herded in a smaller group, through a chute system of arena panels (sometimes lined with plywood to make them appear as solid walls) onto another trailer. The herding can be done slowly or quickly, depending on the skill or intent of the handler (slower is better). Food is also used as an inducement for the herd to get in the trailer. If this next journey is more than a couple of hours, the trauma intensifies exponentially. Sold to individual homes – Now the individual horse buyer comes along and wants just one mustang. The horses at the BLM facilities are held for quite a long time, kept in very small enclosures, and are so broken down that they can be fairly ‘easy’ to herd through a chute system alone onto a trailer. But think what you’re asking of this wild animal who has just lost almost their entire family, been shipped hundreds of miles in a death box, and now you’re asking it to go alone, back into the coffin – a creature who has never been alone for one second, in their entire life? The parallels between what we do to wildies and the Holocaust cannot go unnoticed. Think about it – culled from your family by aggressive men in a terror-filled panic, herded onto moving containers to a holding facility, then separated from all your family members with each of you shipped off to a different prison camp. So Kris and I decide upon the next steps of working more respectfully with Kaliah and making things way less stressful for her. Most of us forget that wildies have no experience with things that are so common to us, we don’t even notice them. For example, they have very little experience of fences. Maybe they’ve come across ranch or perimeter fencing – but they could also turn away and run as far as they wanted in another direction. The concept of being enclosed by a fence is brand new. I expect this is why the BLM make their catch pens so small. The terror is so great, that if you give the horse room to get some speed up, they’re going to do more damage than just banging around the sides of small pen. However, that doesn’t make it right. Because although it may reduce the rate of physical injury, it’s going to massively increase the psychological injury. If you question that, just sit in an airplane bathroom for a few days and see how you feel – that would be a proportionately equivalent space reduction. 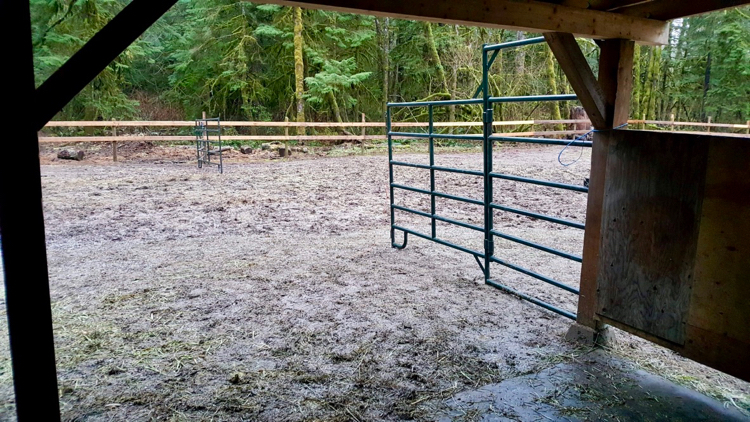 Luckily, the field Kris has Kaliah and her herdmates in is about half an acre and they already knew what fences were by the time they arrived. However, what we didn’t consider is that arena panels are a completely new, scary thing! So not only was a new scary thing introduced on trailer day, it was then moved closer and closer around them. Their water is on one side of these arena panels, so they have a reason to cross back and forth. As the days go by, Kris will add one arena panel at a time, gradually narrowing the gap – so they can get used to moving back and forth through narrow openings and get used to having the arena panels close to them. The next thing Kris did, was to bring this trailer over and leave it permanently there for them to just get used to it being around; seeing it, smelling it, with no human pressure. Of course I would love to use mine, but it is currently marooned in a sea of mud and I won’t be able to get it out till the Spring. *Always be sure to secure a trailer properly, to prevent tipping both front and back if the horses get in and wrestle, or panic, etc. Note: Kris calls Kaliah “Syd” – Sydney is the name she was given when she first arrived. A wildie has likely lived through times of famine or scarcity, so food is a pretty good inducement to approach things they would otherwise stay away from. 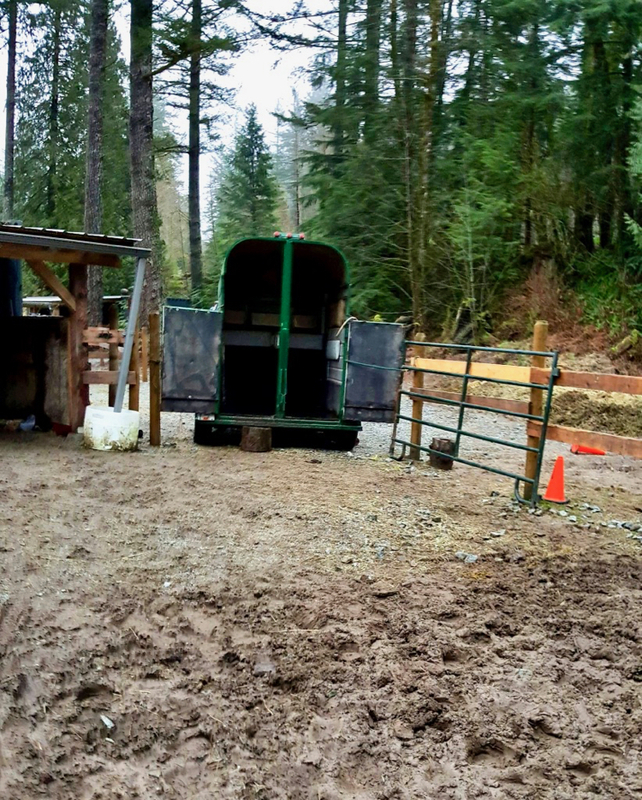 So as you can see here, Kris has put hay both at the trailer entrance and just inside the shelter (another dark, covered space). This hay is in addition to their regular hay feedings. So the goal is not to make them really hungry, to force them to approach the scary things – as that would just be loading their nervous system with more stress. The goal is for this ‘scary hay’ to be a reward, an encouragement, to press through fear. Kris has no idea who’s eating it, but by the next morning, the hay net is lighter. As you can see in the video, Kaliah has also progressed to where she will eat out of Kris’ hand and let her touch the side of her face. I’ve asked Kris not to put a halter on her if she can get by without it. I have a completely different method of halter training, beginning with hand and voice signals first and after they can lead all over just following my hand/voice, then I add a rope around the neck, and lastly I add a halter. This is so that I don’t have to pull on their face, and they don’t get used to someone pulling on their face either. From the time this herd of wildies arrived at Cheekye Ranch, to the time I met them – and you can see how far away they stayed in my previous post – was 2 weeks. Eleven days after my visit, Kris and Kevan tried to load Kaliah onto Kevan’s stock trailer. From the day of the failed trailer loading to this video showing them willingly approaching the trailer and exploring on their own was 8 days. So if you can follow a similar procedure with your wildies, right from the start, know that it’s not going to take weeks or months! These are very intelligent, naturally curious creatures. If you take the pressure off and just set up their environment well, they will naturally and easily learn the skills needed to function in our human world. That is one of the reasons I bought my first 3 wildies together from the same herd (Jax, Montaro and Audelina), because I wanted to keep their family together. Now all of a sudden, I’m thinking it’s a good idea to just get ONE horse with no family other than her (in utero) foal? So I talked to Kris about it and said it might be a good idea for me to take the black & white pinto stud as well. 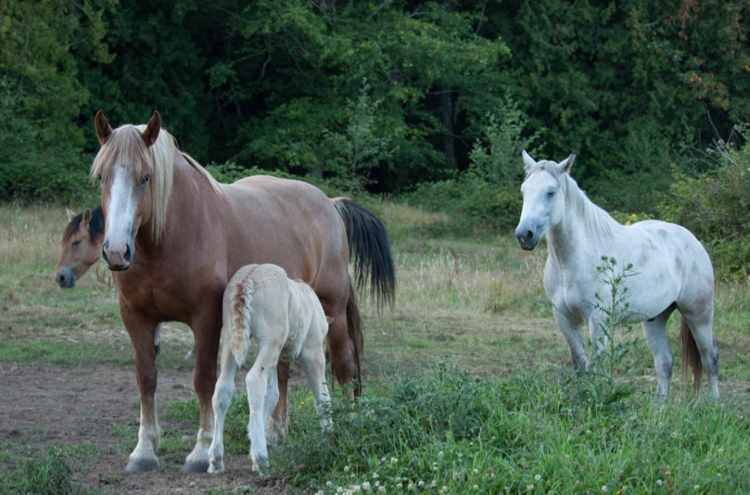 I honestly did not feel I could handle all three, especially since the brown & white pinto mare is definitely pregnant – as that would make FIVE new horses, including the 2 foals. And just way too many horses for the land and shelters I have. However, Kris feels the pinto mare is the most fragile horse of the three (I agree) so she doesn’t want her left on her own. Good point. So… either one person takes all three (which will birth into 5), or, 1 person takes 2 horses (which will birth into 3) and the other horse is left alone. Add to the pot the possibility that the little pinto stud may be the son of the pinto mare, or Kaliah. We just can’t know. He often nudges the flank, near the udder, of the pinto mare, and sometimes does the same to Kaliah. But then Kris has also seen the pinto mare nudge Kaliah in the same place, so she wonders if it’s a sign of deference to the herd leaders? 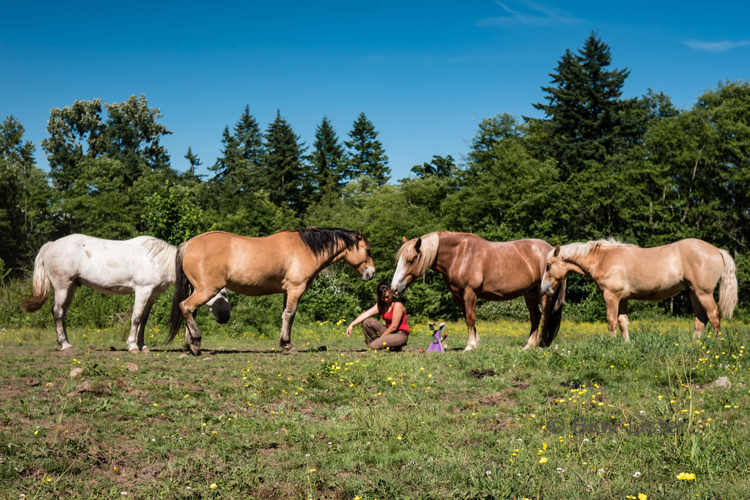 Kris feels that since Kaliah is the strongest character (and pregnant), that she is the best horse to go alone. Good point. I then suggested that perhaps the best way to proceed is for Kaliah to stay there until Kris finds a home for the pinto mare. If that buyer wants the pinto stud too, then let them take both. If not, I will take the pinto stud with Kaliah. In that way, I feel that I am open to any scenario, but let the universe/horses decide. However, Kris is feeling that if Kaliah can come to me, she will be able to progress much more quickly with training the other two. Which is important, since most people don’t want to take untrained horses. Kaliah is such a strong leader that the other two follow her, rather then their own curiosity – thus delaying the pace Kris can progress with training. My biggest fear with Kaliah coming on her own – assuming Kris can get her into the trailer alone – is what will happen when she arrives at my place? By the time she gets to my place, two hours later, will be she be so out of her mind with trauma, that when we open the trailer doors, will she blow through my fence in a blind panic? This is a big concern because one side of my fencing is barbed wire. Also, if she takes off down the road, how will we ever catch her again? The likelihood of her being seriously injured before we could find her, or get anywhere near her would be very high. However, Kris doesn’t feel Kaliah will behave like this once she has felt safe enough to get on and off the trailer of her own accord. Because Kris is not applying pressure to get Kaliah into the trailer, she feels she will be okay when she gets off. She also pointed out that most wildies do not just bolt off a trailer, they stand there for a while after the door opens and take stock before they get off. On my side, I have changed my plans for where I will have her unload Kaliah when the time comes. Rather than putting her into my smaller paddock area, I have used arena panels to section off about half an acre of my field. That way she can run if she needs to. And my herd will be on the other side of the arena panels, so she should be distracted by them and have her curiousity piqued pretty quickly. 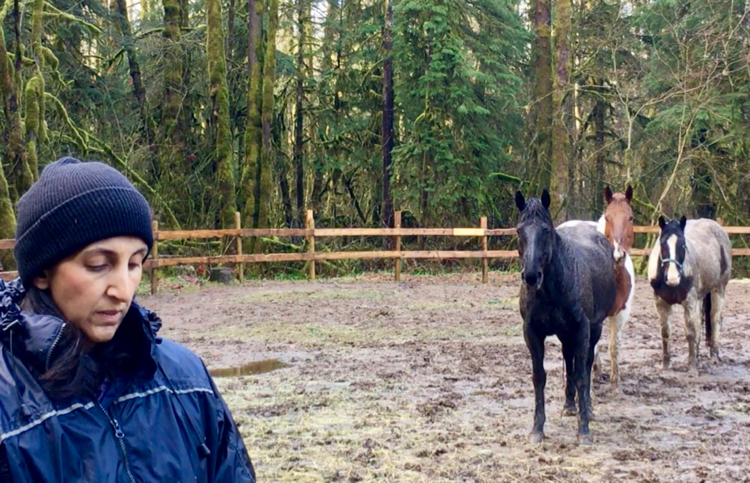 The other option we discussed is to trailer two of my herd up to Squamish, get to know Kaliah and her herdmates over a fence, then be put in together with them for a while. And then trailer Kaliah down with my two, so she is not alone. Kris is not keen on that idea because she doesn’t really have the space available for that. She then suggested I take all three to my place and then after I’ve got the other two halter trained and Kaliah settled in, she can come pick them up. Although I’d be willing to do that, I also don’t have adequate space or facilities (shelters, hay access, etc) to keep all three at my place (separate from my herd) for more than a few days. So basically, I have no idea what will happen! But I am open to follow the horses’ lead and I know they often have better ideas than we do anyway. Thank you Michelle! I love it: POWERFUL POSITIVE FREEDOM!! This is how I want (and believe) the horses can come to view the trailer – as the thing that takes them to super fun, awesome adventures. I myself loathe traveling in a car, or a plane. So I can’t truthfully offer the possibility that a 2 hour trailer ride would be “fun” or remotely enjoyable. What I can offer, in integrity, is that the confinement of the ride is WORTH IT at the other end. It’s why I continue to fly to Mexico, or drive to the Interior of BC, etc. So that’s what I’m going to work on with my herd and the trailer in their field. Building that body experience that you get in the trailer and when you get out, GOOD stuff happens. So I’m going to start by just pulling them 5 minutes down the road to a park where they can eat delicious grass for 45 minutes and then back in the trailer to go home. It’s also short enough that if someone refuses to get back in the trailer, I can walk them home (just had a flashback to your nightmare experience!). However, I would also love to hear how you journeyed to Spirit! Everyone’s story is unique and illuminating. Sorry about the picture. That’s my Arab gelding Gonzo and I. I thought it was going to be my picture with my horse in the little circle. Can’t figure out how to take it out so I guess we will just have to live with it. I have a full head of white hair now but that is me. I can remove the photo if you like – but it’s a sweet photo! Jini if it isn’t a problem I don’t mind if the picture stays. It jus was so overwhelming large when it happened. I am glad to see I finally have a picture of myself with Spirit on all my comments now anyway. Hard to get everybody with me on one. ha ha I am close to getting the link for the The Trail Love Story from Horse Canada Magazine. I will send it to you when it comes. Yes I hope to write up the Spirit story soon. 🙂 BTW the picture above is of my nearly 30 year old Arabian who was born on the property. I may have told you that already. Fascinating journey! I look forward to hearing what unfolds. Two thoughts come to mind. I’ve read that smell for wild horses, along with taste and all of their senses they use to take in info before making a decision. I’m wondering if you can use a smell that would be familiar to Kaliah in the trailer, like a manure pile of her current herd mates, so the trailer would have some familiarity to it. My other thought is when I’m dealing with emotional issues with horses, I will let them pick what flower essences they want. I’m always blown away by what they choose and it gives me a glimpse of their emotional state. I’m no longer guessing or assuming what they feel. Having that piece of input from them gives me confirmation I’m headed in the right direction, or it let’s me know I need to change course.